Frequently asked questions about John M. Schofield. John McAllister Schofield was a prominent Union general who served primarily in the Western Theater of the American Civil War. 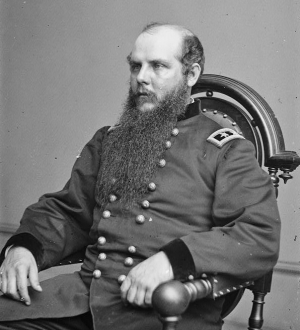 As commanding general of the Army of the Ohio, Schofield played a leading role in the Atlanta Campaign (May 7–September 2, 1864) and the Franklin-Nashville Campaign (September 18-December 27, 1864). After the war, he served briefly as Secretary of War under President Andrew Johnson (1868-1869), Superintendent of the United States Military Academy (1876-1881), and commanding general of the United States Army (1888-1895). In 1892, John M. Schofield received the Congressional Medal of Honor for his "conspicuous gallantry" during the Battle of Wilson's Creek (August 10, 1861).